It’s important that you have access to a vehicle that makes it easy to drive around Cherry Hill, Marlton, and Mount Laurel, and if you’ve been thinking about purchasing a new automobile, a great option is investing in a world-class SUV such as the Honda Pilot. When you own the Honda Pilot, you’re guaranteed to have a great time whenever you get behind the wheel. This SUV offers rock-solid performance and an array of advanced equipment. Check out the 2018 Honda Pilot by reading this review that features information about some of this vehicle’s most irresistible features. If it’s been a while since you’ve driven an SUV, you might be under the impression that these vehicles lack the fuel efficiency that you need. Luckily, when you pick the new Honda Pilot, you’ll have exciting efficiency ratings that are sure to help you save a ton of money on gas. Hit the road in the new Pilot, and you’ll have EPA-estimated ratings up to 20 city/27 highway MPG¹, helping you to stay on the road for much longer. 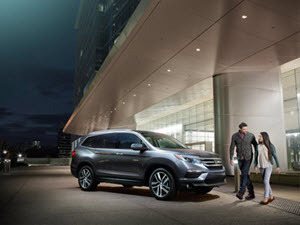 Any driver looking for a fuel-efficient SUV should think about driving the Honda Pilot! Cargo space is one of the most important factors to consider when choosing your next SUV—you want a model that provides a spacious interior that will easily let you store and transport cargo, which is precisely what you’ll find inside the 2018 Honda Pilot. Both the second and third row seats in the Pilot offer 60/40 split-folding capability, meaning they can be folded down to improve your storage space. When you fold both rows down, you’ll have access to a massive 109 cubic feet of cargo volume. The Pilot also offers a 1,500-pound towing capacity for even more cargo flexibility. 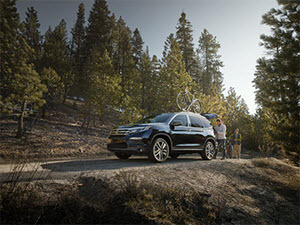 When you’re looking for reasons to go for a ride in the new Honda Pilot, look no further than the outstanding safety features offered by this vehicle. For instance, with the Pilot, you’ll be able to choose the Honda Sensing® safety suite. With Honda Sensing®, driving your vehicle will be easy and safe. This suite includes a variety of active features on which you can depend, including a Collision Mitigation Braking System™, a Lane Keeping Assist System, and Advanced Cruise Control. With Honda Sensing® on your side, you and your passengers’ safety are virtually guaranteed. There are countless SUVs on the market today, all of which provide their distinct benefits. However, if you want to drive the highest quality model in this class, you need to choose the Honda Pilot. Go for a test drive in the 2018 Honda Pilot today by stopping by Burns Honda. At Burns Honda, consumers can find an array of new and pre-owned vehicles, all of which offer great features and are affordably priced. Whatever type of vehicle you want to drive around Mount Laurel, Cherry Hill, and Marlton, we have a model on our lot that will match your exact wants and needs. Contact us right away to take a look at our Honda vehicle inventory. ¹ 19 city/27 highway/22 combined mpg rating for 2WD 6-speed automatic. 18 city/26 highway/21 combined mpg rating for AWD 6-speed automatic. 20 city/27 highway/23 combined mpg rating for 2WD 9-speed automatic. 19 city/26 highway/22 combined mpg rating for AWD 9-speed automatic. Based on 2018 EPA mileage ratings. Use for comparison purposed only. Your mileage will vary depending on how you drive and maintain your vehicle, driving conditions and other factors.